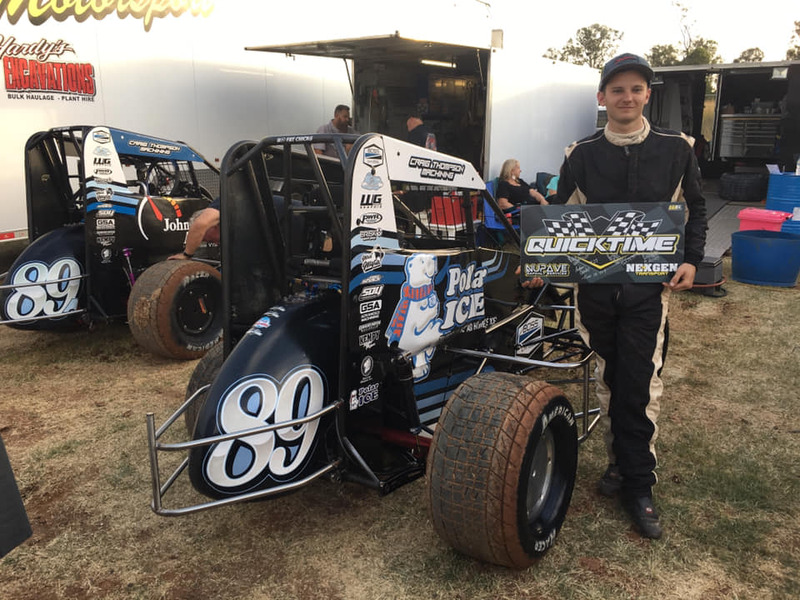 Eagleby’s Darren Vine rocketed to the top of the timing monitor in the recent Polar Ice Midget Series round 5 which was run in conjunction for the 2018/19 Danny Davidson Memorial race at Archerfield Speedway. In front of a huge boxing night crowd Vine clocked in with a 14.071 edging out eventual A Main winner Adam Clarke who ran a 14.203. With QuickTime’s recorded it was the back of the bus in the heats for the dynamic duo of Vine and Clarke although we would see both cars 29 and 6 sit on top of the point’s board after the 4 heat races with points accumulated, Clarke form P1 and Vine scheduled to go from P2. The “Hunter Valley Hurricane” wasted no time in settling into a groove in the JBR 29 Spike setting a blistering speed of 101.166 kph in the 10 lap duration hitting the front within 3 laps and really cranking the Inglis Chev up however hot in pursuit was the “Beenleigh Bullet” of Charlie Brown and the 3Q of Mitchell Rooke with the field crossing at the flag Clarke the victor. Riki Harrison ran home in 4th followed by the “Peoples Champ” Braydan Willmington in the 89N, Bradley Harrison seems to have the fuelling issue that plagued his debut this season sorted in the ex-Abreu Bullet TRD running the race at pace in 6th as Nathan Mathers ,Tom Clauss , Glenn Wright and Gavin McDowell rounded out the field. Heat race two of the night had the 3rd place QuickTime setter of Rusty Whittaker and the other 89 BOSS car of Scott Doyle make it a Neilson Motorsport 1 and 3 at the flag fall with Vine the only car separating the pair in 2nd. Cal Whatmore JNR set his fastest lap of the heat on the final lap running home in 4th ahead of Gary Hudson, Bodie Smith, Audie Malt and Sydney’s DJ Raw in the 15N. Brad Dawson tipped the 81Q over on lap 7 much to the delight of the kids in turns one and two with Brad emerging unscathed the Palmer Boys were able to have him return for the next event and Corey Stothard DNF’d on lap 3. Back with vengeance in the third heat race was “The Bandit” Brad Dawson setting the dirt ablaze with a cracking lap time on the opening stanza of 14.556 at 98.928 kph he hit turn one in the lead and never looked back crossing the run taking the white and black ahead of Glen Wright in the 46Q Aggressor and Darren Vine in 3rd , Charlie Brown ,Braydan Willmington and Bodie Smith rounded out the top 6 from Scott Doyle in 7th, Tom Clauss in 8th Nathan Mathers was next through in 9th and Gavin McDowell rounding out the top 10 finishes , DJ Raw was the only car to drop out on lap 8. Bradley Harrison went into 3 and didn’t come out of 4 early in the piece while running heat race four leaving Rusty Whitaker little time to arrest the 89Q car which would eventually see both cars on the infield to spectate Adam Clarke lead the field home ahead of Mitchell Rooke, Cal Whatmore JNR, Audie Malt, Gary Hudson the only recorded finishes as Corey Stothard was infield along with Riki Harrison who developed an engine stumble on a restart and the 21 and 89 cars of Harrison and Whittaker as mentioned. With the heats done and dusted Clarke would edge out fast man Vine for the P1 grid and it was only on start up for the main event that Vine would learn his P2 grid would now be occupied by Wilmington as the 6Q car wouldn’t respond to taking throttle so he headed infield immediately. Clarke put the hammer down from the get go in the 29 Polar Ice car and checked out however hot in pursuit were the gassers of Brown, Whittaker and Wright who were on charge’s from their allocated starting spots , Brown went top shelf again along with Rusty Whittaker trying to get it to come in for the Midgets and for a time there it looked to be working however as laps ran down it went away faster than it came in and the pair found themselves back amongst the crowd in various battle packs with Glen Wright battling for a podium with Charlie Brown as Brown crossed in 2nd and Wright just off in 4th , Wilmington crossed in 3rd again for the second time in his 2 trips to Archerfield this season. Whittaker and Rooke battled for track position with Whittaker coming out on top of that one crossing the 20 lapper in 5th bumping Rooke back to 6th Brodie Smith put in another clinic drive in 7th just ahead of the “Nupave Flyer” Riki Harrison in 8th, The Bandit ran in 9th and Cal Whatmore JNR rounded out the top 10, Scotty Doyle may have been seen fist pumping for 11th which may sound funny but the runs those boys have been having just finishing was a small victory hopefully the black cat moved on and more finishes are on the cards , Mathers, Clauss and Bradley Harrison ran 12th 13th and 14th respectively with DJ Raw , Gavin McDowell and Audie Malt rounding out the 17.Corey Stothard was infield with just the 6 laps completed. Clarke headed to victory lane flanked by Brown and Wilmington not only taking round 5 in the series but the 2018/19 Danny Davidson Memorial as well! 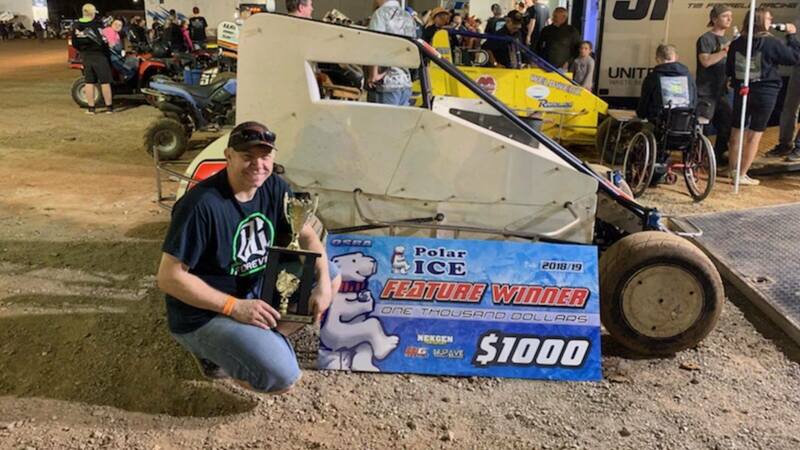 Building great momentum before the team make the mega trek west for the 2018/19 Australian Speedcar Title where Clarkie is no stranger to claiming that event. Night’s highlights would have to go to Glen Wright in the Nexgen Aggressor of Dylan Byrne after starting out the evening with some small electrical gremlins he came on super strong from the flag fall in the main event and as mentioned only just missing a podium spot on debut for the 46 team, He also took out the Revolution Racegear Sunshine Coast lucky 4th place! Nathan Mathers, Gavin McDowell and Audie Malt were all running very fast and clean laps the entire night. 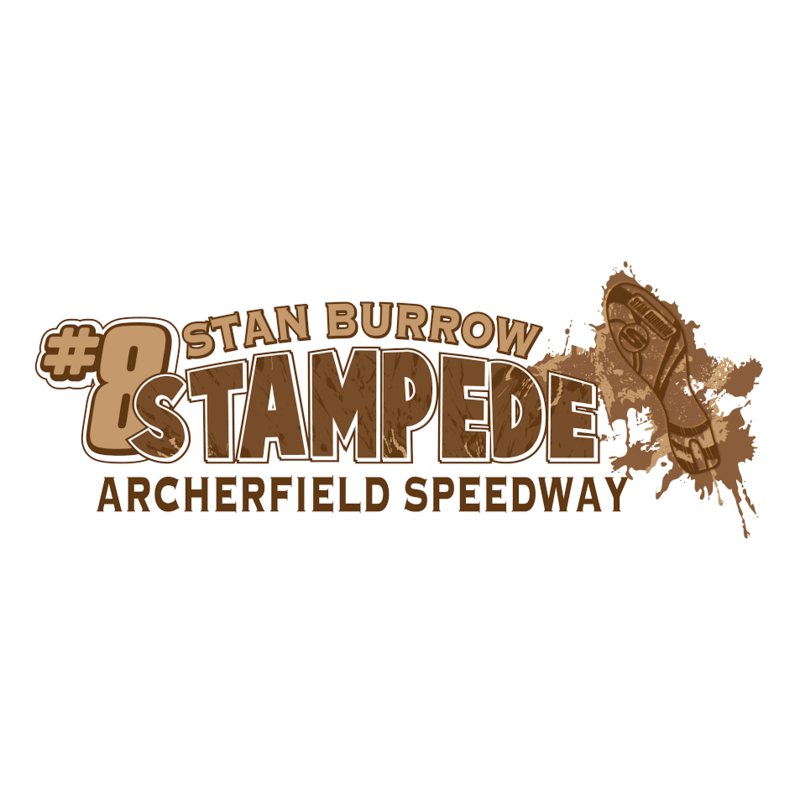 Our next event on the calendar is the Stan Burrow Stampede Friday the 4th of January so ensure you are track side race fans because this is going to be huge !! From the QSRA Committee and its loyal members we would like to wish everyone a very Merry Christmas and an even Happier New Year ! 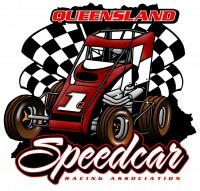 Remember to stay safe on the roads and stay tuned here or to the clubs official Facebook page https://www.facebook.com/queenslandspeedcars/ for all the racing news and updates. We are on Boxing Night at Archerfield with Polar Ice R5/DDM 18/19 then again celebrating “The Man” Stan Burrow in the Stan Burrow Stampede on January 4. Don’t forget the Queensland Title on January the 19th in Lismore as well, Nominations need to be into Brock Dean as per normal for this event. Boxing night racing at its finest !!! This coming boxing night race fans the Polar Ice Midget Series returns to Archerfield Speedway and in conjunction with the 18/19 Danny Davidson Memorial we have a great field of cars nominated. 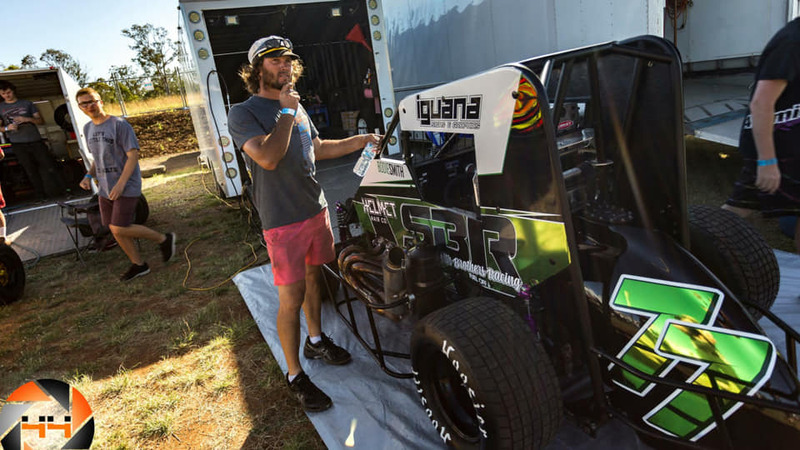 Adam Clarke returns from a stint in WA where he made the podium in the John Day Memorial from the rear of the field , Darren Vine will be back in the ex-Clarke car along with Bradley Harrison in the ex-A1 Rico Abreu bullet/TRD. The Nupave/Nexgen QuickTime award returns as well as the Revolution Racegear Sunshine Coast lucky 4th place is back ! With the first of the local series “draw and invert” rounds the hot laps session was underway on a rather heavy track with everyone gingerly pacing around the circuit not wanting to join the prestigious honours roll on the tilt tray after the timed sessions. Rusty Whittaker topped the times with a 15.100 followed by HLR’s Charlie Brown, current compact speedcars A1 “lightening” Tim Farrell, returning to the Midget ranks from compacts was Gary Hudson in 4th and rounding out the top 5 was eventual main event succeeder Darren Vine. Mitchell Rooke for Rodney Singleton Racing would lay down the quickest speed in the first heat race of the night at 105.332 kph chasing down heat race winner Vine while holding out the pressure of Callum Whatmore JNR in 3rd, Chris Singleton in 4th, Bodie Smith returned after some damage sustained in the previous round feature crossed with a 5th, Scott Doyle was in 6th after feeling some pressure from Tom Clauss finishing in 7th and Nathan Mathers rounded out the 8 car field. The night’s second heat saw a bit of carnage mid turns 3 and 4 with the end result being 3 cars knocked out of the 8 lapper those cars of Brad Dawson, Tim Farrell and the unlucky one having nowhere to go was Gary Hudson all relegated to watching the event infield, Unfortunately the Hudson crew worked hard to have the 69Q car repaired for the reminder of the night but there was too much damage sustained and they would ultimately be done , Rusty Whittaker took out the event ahead of Charlie Brown who was trying to bring the top line in buzzing the fence but it was to no avail as he was now under pressure towards the end from Riki Harrison with Audie Malt and Gavin McDowell both having clean runs to the end. Heat race three was another event that knocked a car out for the night up in turn 2 the Chris Singleton car had a spin leaving Scott Doyle zero real estate to pull up the 89A car and that was murder she wrote for the Doyle’s, Darren Vine went on to lead home the field of Whatmore JNR , Clauss , Rooke and Bodie Smith. Brown continued to try the high line in the final heat race on the programme whilst attempting to run down Rusty Whittaker but again the top was offering zero and again towards the end of the 8 lapper Riki Harrison was applying the blow torch to the 11Q car of Brown, Farrell, Malt and McDowell and Mathers all crossing in that order at the chequered. Darren Vine got the jump at the start of the 20 lapper leading the field into turn one with Whittaker and Brown in tow Chris Singleton was an early retiree without a lap completed ,Tom Clauss would find himself infield with just two revolutions down and Nathan Mathers was the only other “DNF’er” after completing 12 laps , Charlie Brown continued to crop dust the top line this time Riki Harrison bolted into 3rd settling into a rhythm behind Whittaker and Vine with the trio crossing in that order , Vine lead all of the 20 taking the Paul McManimm owned Spike to victory lane. Charlie Brown picked up the nights Revolution Race Gear Sunshine Coast “Lucky 4th place” voucher, Rooke was home in 5th ahead of a great drive from Bodie Smith in 6th The Farrell Team had repaired the 51Q Racer from the earlier heat race carpark wreck for him to round out the 20 lapper in 7th Cal Whatmore JNR , Audie Malt and Gavin McDowell put in a tidy race to round out the 10 finishers. The nights highlights had Gary Hudson showing great promise in the ex-Dillion Eagle now 69Q, Gavin McDowell and Audie Malt both running in some very tidy laps. Huge shout out to JBR’s Adam Clarke , the team ventured over to the West and competed in the John Day Classic Saturday night after winning the right for the P1 start after the heats and pole shuffle Clarkie opted for a rear of field start and if he made the podium after the 40 lapper memorial race he would pick up an extra 7k bonus payday ……. Clarkie took the 29Q to 3rd at the flag!!! Well Done Adam and JBR! One person who was noticeably missing from last night was our pit marshal Barry Lane, Our thoughts and prayer are with Life Member Barry and Family at this stage. Our next outing will be boxing night at Archerfield for Polar Ice R5 in conjunction with the 2018/19 Danny Davidson Memorial and then just days later on January 4th 2019 will be the annual Stan Burrow Stampede! 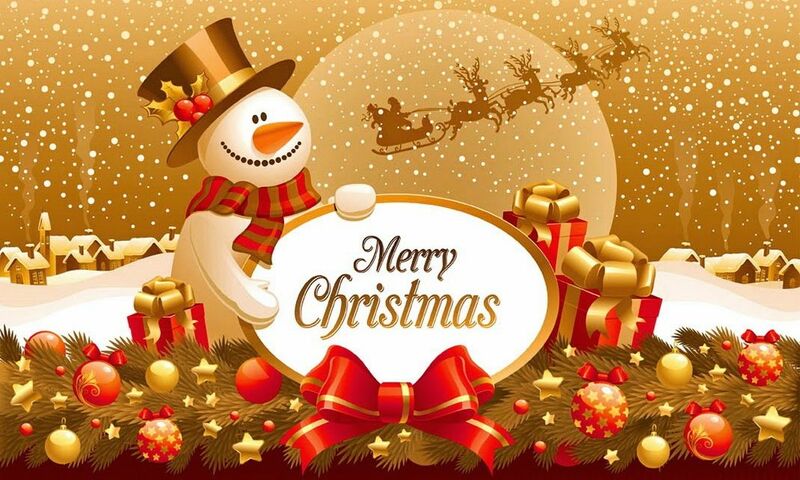 Have a safe Christmas see you all on the 26th ! REVOLUTION RACEGARS SUNSHINE COAST LUCKY 4TH PLACE TO …..
Revolution Racegear Sunshine Coast lucky 4th place getter is Charlie Brown ! Just letting all QSRA financial members know Lance Towns has stepped aside from the Presidential role for business/personal reasons. Vice President elected Gary Greenwood has filled the President role and Chris Foreman has now taken the VP slot vacated by Gary. Sid Whittaker has been appointed Speedcars Australia Delegate. Two new committee members have been appointed by the commitee and are Dylan Byrne and Bradley Harrison. 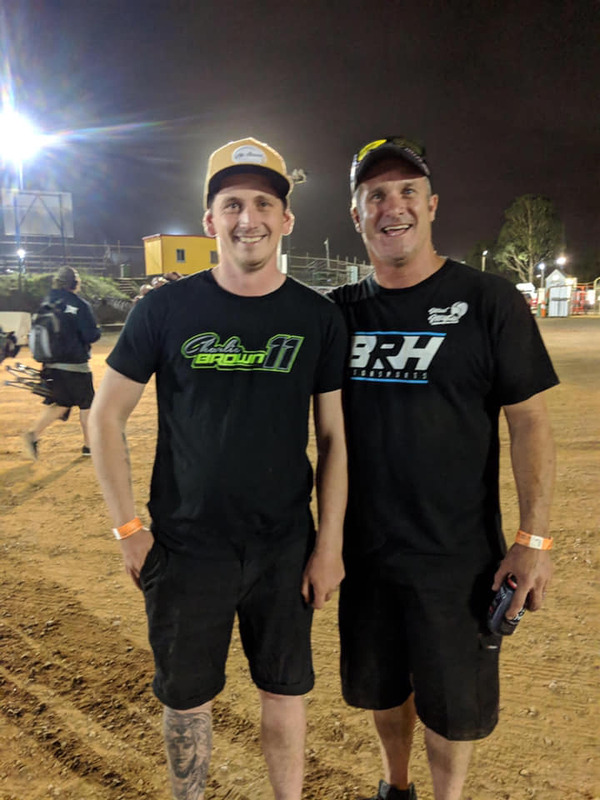 Graeme Flynn from Revolution Racegear Sunshine Coast has very kindly jumped on board with the QSRA so now as of Polar Ice R4 up for grabs in the nights main event the driver who crosses the line in “lucky” 4th place will earn themselves a $100 Revo in-store voucher !! 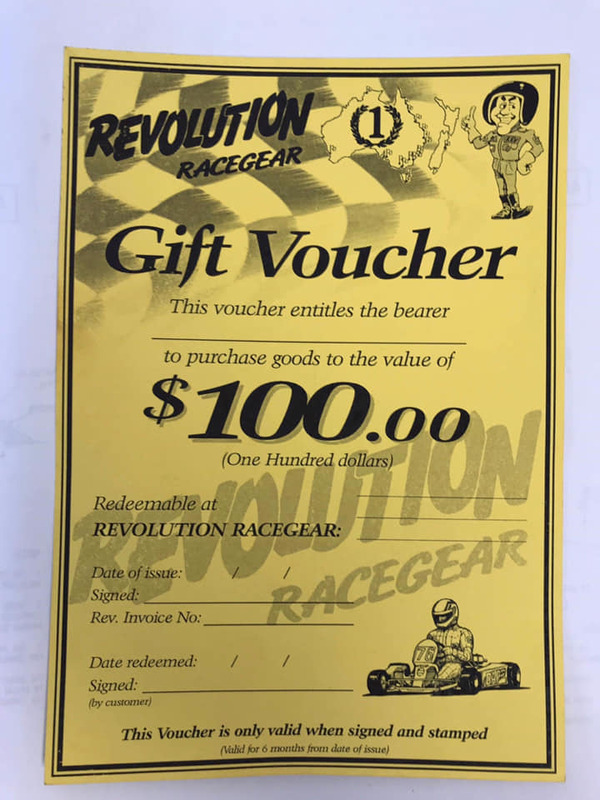 Note: Vouchers must be redeemed before the end of the 18/19 race season and only in-store at Revolution Racegear Sunshine Coast. This weekend race fans will see the Spike Ed Pink 77Q of Bodie Smith return after a feature race wreck in the last outing as well as “Singo” Chris Singleton in his 26Q Spike Esslinger.